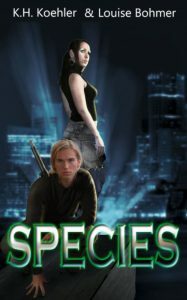 Species, the urban fantasy I wrote with K.H. Koehler, is now live at Kindle! This will be the last book I’ll write for a long time, so I hope you all enjoy it. Go snap up a copy now! Link and blurb below. Hope everyone had a great Halloween! About: The world is weird. Leigh had no idea how much so until she gets attacked by a vampire-like… something. And now she’s one of them. What’s worse, absolutely none of the usual rules apply. The Species, as they are called, operate in a shadowy underworld of gothic debauchery, secretly controlling almost every part of human society. And then there’s Aidan… one of the most powerful, troubled, and beautiful of the Aristocrats. Leigh could fall hard for the guy, but then she uncovers a massive, global conspiracy by the Aristocrats to turn the human race into cattle and the other Subspecies into slaves. There’s a civil war coming. And if Leigh and Aidan can’t stop it, then it’s the humans who will pay the ultimate price. If you like action-packed urban fantasy, pulse-pounding paranormal romance, and an unforgettable adventure, then this novel is for you! Leap into the world of magic and corruption. Get your copy of Species today! Big thanks to everyone who has already grabbed a copy!